Politiskt våld | Vad händer i Mellanöstern idag? 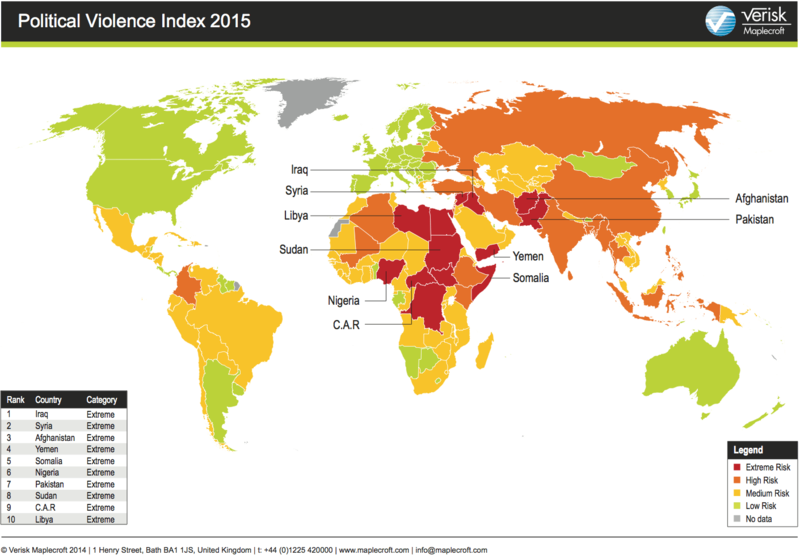 Leading global risk-analytics firm Verisk Maplecroft has released its Political Risk Atlas (PRA) for 2015, and the outlook is bleak. Over the course of the next year, global stability is likely to continue to remain shaky as the world grapples with four major challenges: An increased threat from militant Islamism, aggressive Russian foreign policy, rampant global corruption, and elections in restive countries such as Myanmar and Nigeria. Maplecroft’s predictions come after a year in which violence spiked around the world. Between Nov. 1, 2013 and Oct. 31, 2014, terrorism fatalities increased by almost 25%. Mass-casualty attacks by groups such as ISIS and Boko Haram have become more effective, leading to a higher death toll for each attack. Verisk Maplecroft expects that despite efforts aimed at curbing terrorism, political violence will continue in Syria, Iraq, and Nigeria. Egypt and Libya have also been highlighted as potentially dangerous countries to watch for future terrorist incidents throughout 2015. Terrorism isn’t the only reason the firm is predicting a tumultuous 2015. Verisk Maplecroft has flagged Russia in particular as a significant source of future political risk and uncertainty. The overall concern is that as Moscow’s economic situation further deteriorates, Putin may instigate external conflicts in a bid to maintain popular support. The world also faces larger systemic issues, aside from terrorism and Russian aggression. Nearly 70% of countries worldwide were rated as being at ”extreme” or ”high risk” in Verisk Maplecroft’s Corruption Risk Index, and 41% of countries were rated in the same categories in the Civil Unrest Index.